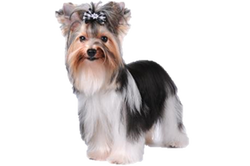 Bred from Yorkshire Terriers, the Biewer Terrier (pronounced Bee-vare) has been kept solely as a companion animal, although their ancestors were ratters. The Biewer Terrier originated in Germany in 1984 when a piebald Yorkshire Terrier was born to breeders Gertrud and Werner Biewer. Taking a liking to this specific coloring they began a breeding program to produce more dogs, giving them the name Biewer Yorkshire Terrier à la Pom Pon. Although some breeders have bred back to Yorkshire lines in the past this is now prohibited. Still considered a new breed, they do not currently have full recognition by any of the major kennel clubs, although the American Kennel Club (AKC) added them to their Foundation Stock Service in 2014. Is the Biewer Terrier Right for You?